The Brondell O2+ Halo Air Purifier is fully adjustable to your needs, any time, any season. With its three-stage air purification system, the O2+ Halo eliminates allergens such as dust, pollen (including tree, grass, and ragweed), pet dander, mold, and harmful VOCs. The certified True HEPA filter removes 99.97% of particulates and allergens as small as 0.3 microns while the woven carbon filter effectively reduces smoke, foul odor, and off gassing VOCs including Formaldehyde and Benzene. The simple intuitive controls provide personalized settings for every member of the family. 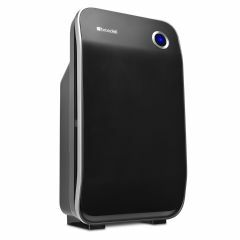 The air purifier features an air quality indicator and auto mode which automatically adjusts the machine to match the air quality in the room. With its sleek compact design, the O2+ Halo is ideal for any home or office. Also available replacement Advanced Deodorization Upgrade Filters.